Fully titled as "Space Quest: Chapter I - The Sarien Encounter", this graphic adventure game created by Sierra On-Line way back in 1986 suffered cuts after legal issues and lawsuits. While this game is littered with pop culture references, with nods to Star Wars IV: A New Hope, the Genesis Device from Star Trek II: The Wrath of Khan and the robot from Lost In Space, some parties didn't take too kindly to their likenesses being used without permission. After crash landing on the planet Kerona, the player must search for a way home. While exploring a place known as Ulenca Flats, the player comes across a store called "Droids R US", whose logo and name bears close resemblance to toy store chain Toys R Us and the "Rocket Bar" features performing bands that look a lot like the Blues Brothers and ZZ Top. 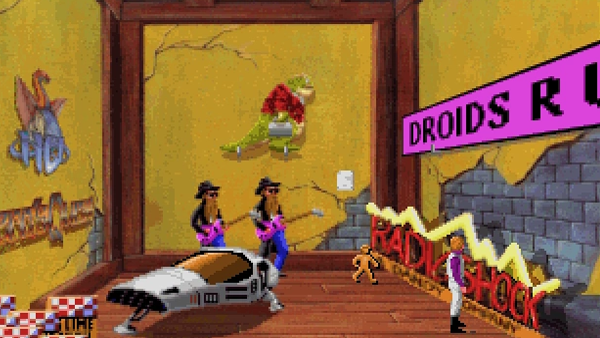 Toys R Us sued Sierra, leading remakes of the game to have the store name changed to "Droids B Us" and ZZ Top also took legal action against the developer. The bearded rockers actually still featured in early copies of the remake, but were later replaced with a generic alien band. A lover of video games, Star Wars, and cereal. Thinks Starfox Adventures was really good.